In addition to being a contributing editor for PMY, I’ve been a professor at Webb Institute for more than 20 years. During that time I’ve have had the pleasure of teaching courses in naval architecture to some of the brightest undergraduates in the marine industry. One particularly memorable student was a personable young man named Joe Corvelli, a motivated pupil with a passion for small-craft design and construction. Upon his graduation from Webb in 1993, Corvelli took a job in the “big ship” sector of the marine business, working for a company that was promoting energy production and transportation in the Far East. But a half-dozen years later he said bye-bye to the corporate rat race and set out to fulfill his dream of building boats. Exploring different options for getting into the boatbuilding business, Corvelli came across Liberty Yachts, a modest yard located in West Palm Beach, Florida. Founded in 1976, Liberty was a brand waiting for new ownership and fresh ideas in the late 1990’s. Corvelli and his dad saw the yard’s potential, and after a year of research and planning, they purchased the enterprise. 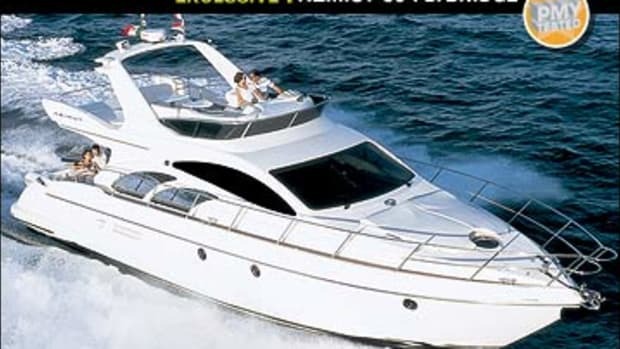 During the next few years they focused their efforts on product quality and improved construction methods, concentrating on the only production model Liberty offered at the time, a 42-footer in either a flying-bridge or open layout. It was not until Corvelli had everything humming perfectly that he turned his attention to designing a new model, a 45-foot flying-bridge plan that offers larger accommodations and more pleasing proportions than the 42-footer. It was a pleasure to see Corvelli again, but I have to admit, for a brief moment it felt like he was back to being my student and I was grading one of his projects. Checking out his latest creation, my brain went into “red-pencil” mode, ready to take off “points” for any errors I might find. How would the Liberty 45 stack up? Would it make the grade? These questions were quickly put to rest, as Corvelli pointed out one feature after another that made this boat something special. The most distinguishing characteristic is simply the way in which she is laid out. Rather than the usual saloon-above-the-engine-room scenario, the Liberty 45 (like the 42) is reminiscent of the classic Bertram 31; forward of the cockpit there’s a motorbox on either side, with a walkway between that leads to the saloon. This arrangement means the saloon sole is at nearly the same level as the cockpit (it’s actually one step down from the cockpit to the saloon), giving the boat a lower profile, a correspondingly lower center of gravity, and better stability. 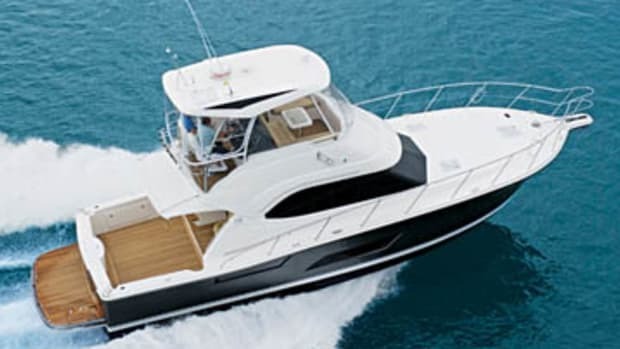 It also eliminates the usual dozen or so steps from the cockpit to the flying bridge that most other boats have; from the top of the motorbox, it’s just four steps up a ladder to the helm station on the command bridge. And it’s not just that it’s an easier climb—it puts the helmsman in closer touch with the action (and the conversation) going on in the cockpit. 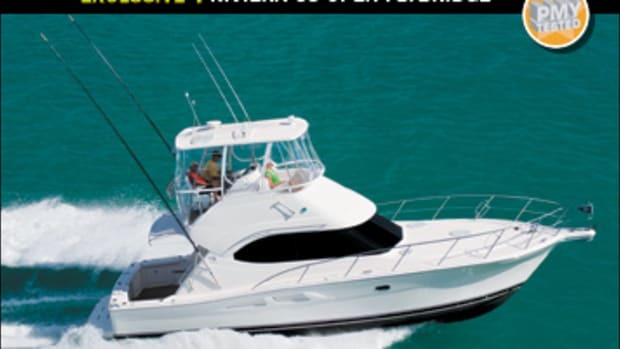 Both motorboxes tilt aft a full 90 degrees, offering complete access to the boat’s optional 900-hp MAN diesels. And instead of using finicky gas shocks to help lift the motorboxes, Corvelli took a simpler approach; the fiberglass boxes are cored with Nidacore honeycomb, so they’re light enough to be raised easily by hand. 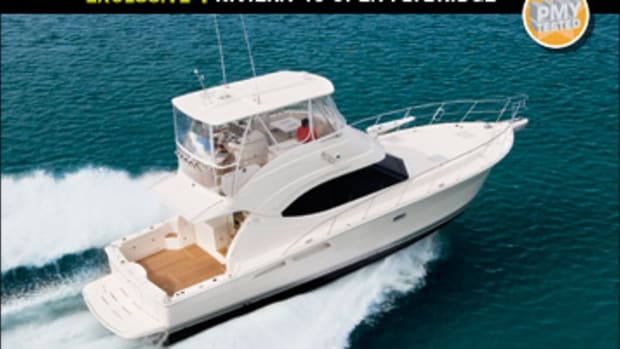 And that’s typical of how the whole boat is built; liberal use of various core materials (even throughout the interior joinery and countertops) helps cut the dry weight of this 45-footer to a trim 28,000 pounds. As a bonus, the honeycomb core in the motorboxes is also an effective sound-absorbing material. While we had the motorboxes raised, I noted that the inner surface of the hull had been faired and painted. Corvelli pointed out that all fiberglass surfaces are sanded, faired, and painted with Awlgrip. 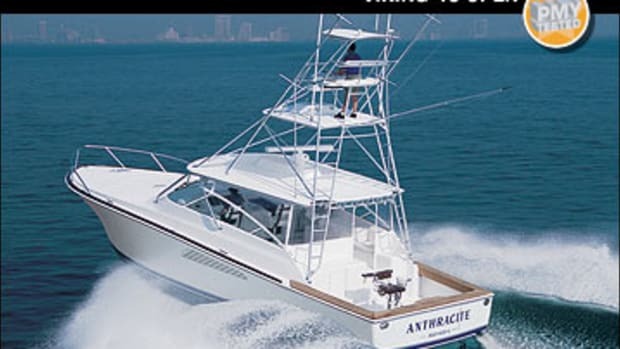 Even more impressive, there are no caulked seams; wherever fiberglass parts are joined, the seams are glassed, faired, and finished with Awlgrip, making the boat look as though she was molded in a single piece. Though this is a highly labor-intensive procedure, it’s just one of the many details that Liberty insists on to establish itself as a high-end custom builder. Another detail that Liberty insists on is the lack of penetrations in the sides, so the hull will never have an unsightly stain caused by overboard discharges. All overboard drains (including hatch gutters) are routed to a single manifold, and then to an overboard discharge in the transom; sink and shower drains are routed to the gray-water tank. Even more unusual, there’s no holding tank; instead, the boat has a Raritan Atlantes MSD that reportedly includes an environmentally sound sewage-treatment system. Similar attention to detail was evident in the yacht’s interior. Tucked into the space-conscious galley area were four Sub-Zero under-counter drawer units; two refrigerators and two freezers. Joinery was flawless and top quality. Drawers were all made of solid cedar and fitted with teak veneers—sturdy and handsome. Countertops were 1/8-inch-thick granite over 3/16-inch-thick aluminum honeycomb, offering the look, feel, and ease of maintenance of stone but with a lot less weight. 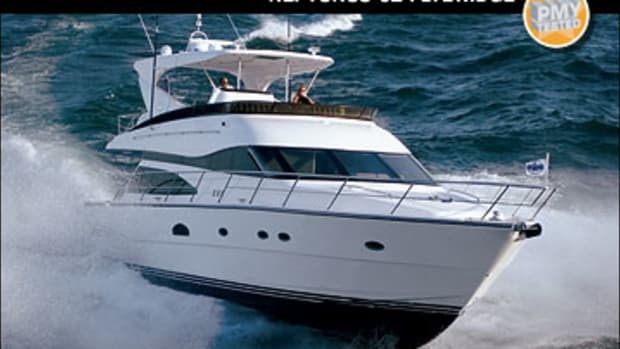 And as a custom builder, Liberty was able to accommodate the owner’s request to fit the boat with the same granite pattern he has in his kitchen at home. In sumptuous complement to the granite countertops is the glove-soft feel of the custom upholstery in the saloon: supple and smooth as genuine leather. Corvelli explained that it felt like real leather because it was real leather, as per the owner’s requirement. 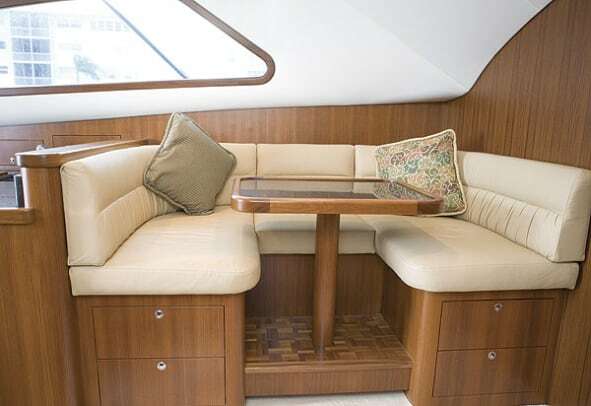 Secure stowage for rods, tackle, and other gear is hidden beneath a settee along the starboard side, opposite a U-shape dinette. Recessed lighting built into the toe kicks on either side of the saloon is one of the subtle touches that make this boat distinctive. Another nice feature is the queen berth in the forward stateroom; at the touch of a button, it raises electrically, revealing more stowage space beneath. As I observed the modest proportions of the galley and the odd fact that neither of the saloon settees can convert into additional berths, Corvelli reminded me that the interior of our test boat, like that of every Liberty 45, is configured according to each owner’s specifications. 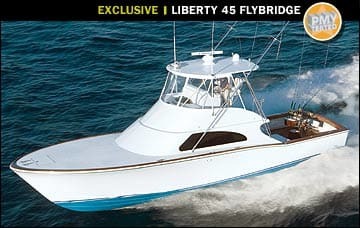 How the boat handles, however, is not negotiable, and with winds of 20 knots or more blowing out of the northwest, it was a great day to see how the Liberty 45 performs. Seas outside the West Palm Beach inlet were short, steep, and nasty: four- to six-footers with whitecaps. But with a hefty 20-degree transom deadrise, our test boat took the challenge in stride. 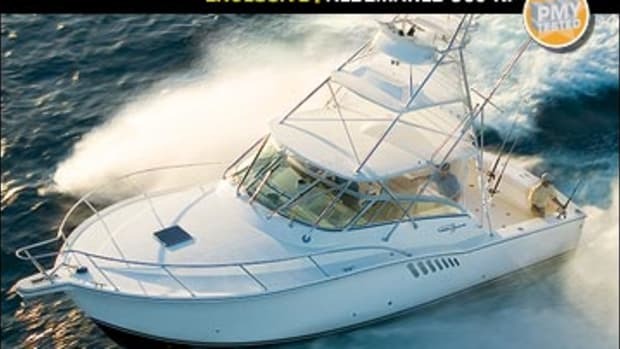 We pushed her close to 35 mph in head seas and ran her flat out at more than 44 mph in cross seas and down wind; dry decks and no slamming, even after going airborne off the wave crests. Just as important, she tracked straight and true even in beam seas with my hands off the wheel. And while drifting in the troughs, we felt her seven-inch chine flats quickly damping roll motion as each wave passed. We ran measured trials on an open stretch of the ICW, and she left a clean, smooth wake; and with auto-locks on her 30-foot Rupp outriggers, it was easy to lower them so we could sneak under bridges. Twin Disc QuickShift controls made backing into our slip a simple task, despite stiff crosswinds. Once all of our lines were secure, I mentally reviewed my “report card” on the Liberty 45. About the only nit I could pick was tight access to the genset, which is shoehorned into the lazarette. Other than that, I’d give her an A-plus on all counts. 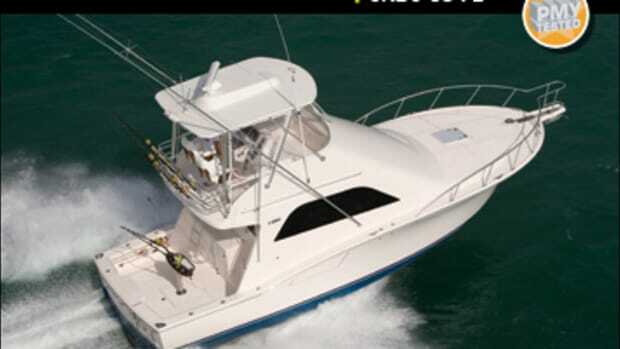 For more information on Liberty Yachts, including contact information, click here. 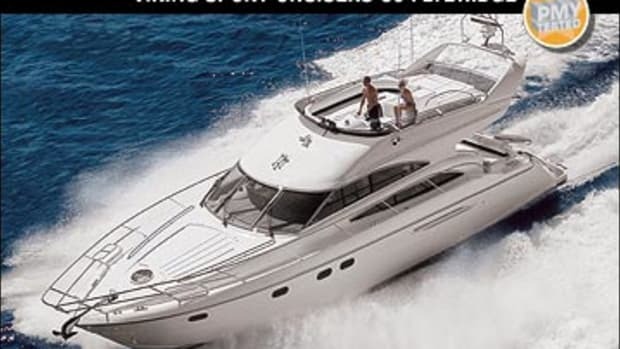 This article originally appeared in the March 2007 issue of Power & Motoryacht magazine.